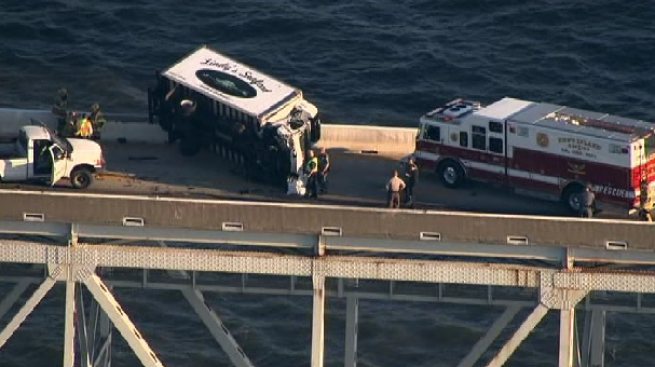 All lanes have reopened on the Chesapeake Bay Bridge, several hours after a multi-vehicle crash left an overturned box truck hanging over the edge of the bridge. The truck has now been removed, and inspectors said the bridge is safe for traffic. The eastbound lanes were shut down for several hours in the wake of the Friday morning crash. Two-way traffic went into effect on the westbound span until the eastbound span reopened and delays had cleared. At one point, delays on eastbound U.S. 50 began about four miles from the Bay Bridge, the Maryland Transportation Authority (MDTA) said. There were no details immediately available about the crash. However, no one was injured, said a spokesman for the Anne Arundel County Fire Department. Crews had to remove fuel from the truck's saddle tanks before the truck could be uprighted and towed from the bridge, the MDTA said. Vehicles behind the accident were left stuck in place for several hours. Box truck currently being towed off EB Bay Brg!! EB span remains closed. 2-way in effect. Box truck leaning on barrier while crews remove fuel from truck's saddle tanks. 1-877-BAYSPAN.